Tom P: A welcome return of two favourite creative teams and characters this week, the first being Mighty Thor #1. 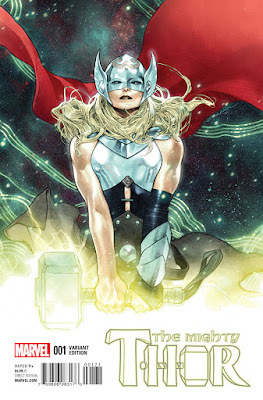 I loved Jason Aaron and Russell Dauterman's take on the new female Thor and I honestly thought it was the best thing Marvel had published since Rick Remender's Uncanny X-Force. It ended too soon and I'm desperately anticipating more, so this has the honour of being my first post-Secret Wars purchase as I dip my toe into the new Marvel Universe. The next is Batman: Europa #1 which sees artist Jim Lee returning to illustrate the Dark Knight with this Europe-based, four-part Batman miniseries that's written by Matteo Casali and Brian Azzarello. I can't tell you how much I'd love to read a decent Batman comic again! How good is Tokyo Ghost?! I think it's great and I've been having an absolute blast with the book. I love its grim take on the future of Internet addiction and I hope Remender and Murphy partner up more often! That just leaves Star Wars #12 which continues to capture the spirit of the movies and makes me even more excited about the new film coming out next month! You've heard about that, right? Kenny J: Although lacking that Lemire personal touch, the first issue of Extraordinary X-Men had a ton of familiar faces, beautifully drawn by Humberto Ramos. That is enough for me to return for issue #2 in order to see if the story pushes forward any more. I've missed having an X-title on my pull-list so Extraordinary X-Men is really a welcome addition. This week also sees the return of Kelly Sue Deconnick’s Pretty Deadly; I know this wasn't to everyone’s taste, with a very supernatural take on the Western genre, but I have noticed the absence of Emma Rios' striking art from my monthly purchases. It is a triple treat of my favourite artists this Wednesday, as Sean Murphy’s collaboration with Rick Remender is also hitting the comic book shelves. Tokyo Ghost #3 falls into the science fiction category of the writer’s work where he explores grand themes through often quite intimate stories, and like Black Science and Low before it, I'm on board for the duration of the series.